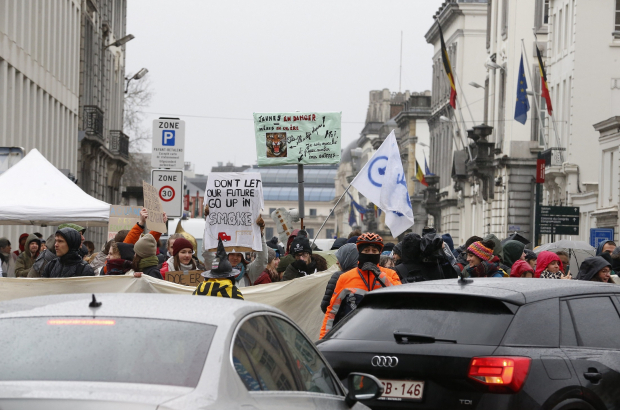 As climate activists blocked the Rue de la Loi in Brussels, Flemish innovation minister Philippe Muyters announced an investment of €400 million in research and practical applications that save energy and reduce carbon emissions. The funding, aimed at industry, should help reach the region’s goal of being CO2 neutral by 2050. The €400 million injection, he said, is a “moonshot” – a word used to describe technological projects that are not profitable in the short-term – to jump-start the process. The money will go to research and innovations that are focused on one of the three pillars: Reduce, capture, re-use. There are currently several examples in Flanders of this kind of circular energy cycle, either in use or in development. AB InBev is experimenting with “supertrucks” that reduce the number of lorries on the road. Ghent University’s Capture programme connects companies that produce by-products with other companies that can use them. Rotor Deconstruction is working to demolish buildings in a way that materials can be reused rather than sent to the dump, decreasing consumption in one of the world’s most waste-oriented industries. So Flanders “doesn’t have to start from zero,” reads the statement from Muyters’ cabinet. The minister has put Catalisti in charge of co-ordinating the new funding. Catalisti is an umbrella agency that works with chemicals and plastics manufacturers on transitioning to green industrial processes. Muyters’ announcement arrived at the weekend as hundreds of people blocked the Rue de la Loi in Brussels to demand the passage of a proposal to alter Belgium’s constitution. The protesters, led by more than 70 climate-oriented groups, are demanding that politicians approve the proposal when it comes up for a vote on Tuesday. The proposal would add a single sentence to Belgium’s constitution to allow the federal parliament to embark on an ambitious climate plan that has already been prepared. While concrete policies would still need to be created from the plan, the plan itself cannot be considered until the constitution is altered. Normally a neutral zone where protests are not allowed to take place, the Rue de la Loi, home to the federal parliament, was the site of the sit-in yesterday. Protesters will be present 24 hours a day until the vote on Tuesday, but moved this morning to the nearby Troonplein following a discussion with police.